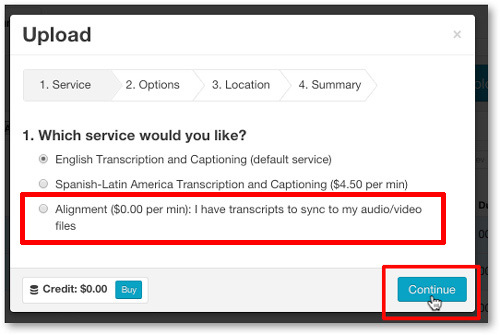 If you already have transcripts for your Spanish video/audio files, the Spanish transcript alignment service is a faster and less expensive way to create captions and/or use the 3Play Media interactive video plugins. After signing into your 3Play Media account click Upload located on the top, left hand side of the page. Click Choose Files if the media file you are submitting for alignment is on your computer. Click From Links if you are submitting public links to your media files. Click Linked Account and select the linked account you would like to submit content from for transcript alignment requests. 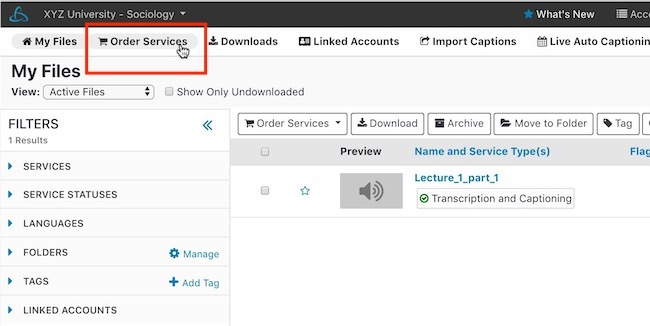 After uploading the media file you will be directed to the Upload > Service menu where by default the English Transcription and Captioning service is selected. Once Alignment has been selected click Continue. By default English will be selected. Select Spanish from the drop-down menu if you are aligning a Spanish transcript to a Spanish source media file. Next create a folder where you want this file to reside or select a folder that already exists in your 3Play Media. If you are satisfied with your transcript and have checked to make sure the transcript corresponds to your media file, click Submit for Alignment and your file will begin processing. Click Save for Later if you would like to leave this page and submit the file for alignment at a later time. Click Clear if you would like to remove the text that was added to the transcript alignment text box. PRO TIP: The text you get back and use in the interactive transcript plugin or download in transcript file formats will look exactly like the text in the upload box right before you hit submit. If you are submitting more than one file for alignment, be sure you are adding the correct transcript to the corresponding text box. There will be a text box for each media file you chose to upload for the alignment service. The media file's name will be located on the top, left-hand corner above each box. 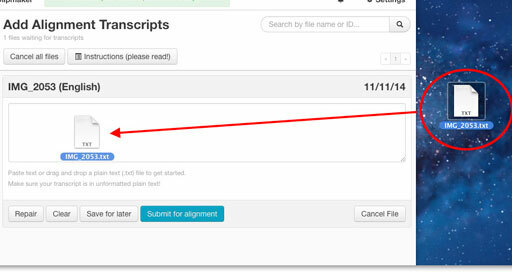 You will need to click Submit for Alignment for each transcript you want aligned. 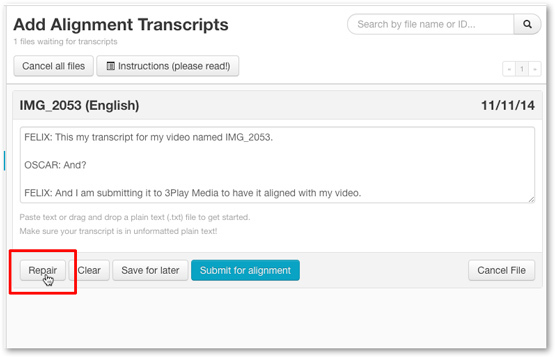 Click Repair below the text box if want your transcript and speaker IDs automatically formatted. When Repair is clicked, Speaker ID's will get converted to all caps with a colon, e.g. Speaker 1: becomes SPEAKER 1:. If you don't like the way the text looks after formatting, you can cancel the job and reimport the transcript and then make edits either within the text box or format them offline within a text editor. NOTE: If your transcripts contain lots of colons, you may want to manually repair your transcript and not use the Repair function. If you want to cancel this submission, click Cancel this job located on the top, right-hand corner above the text box. One more prompt will follow to confirm this cancelation. Each text box has a Cancel this job button. If you leave this page before submitting your transcripts and media files, you can get back to this page by clicking the Add Transcripts for alignment under Activity of the My Files page. There will be a count of how many files are waiting to be submitted for the transcript alignment service.